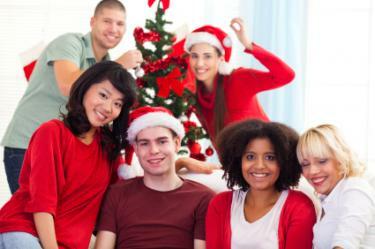 A holiday party can be a great way to meet new people. 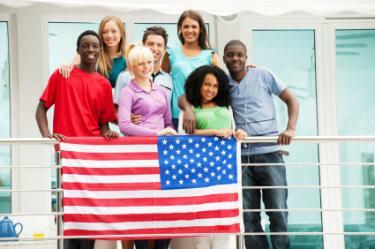 Whether you are hosting a neighborhood, office or family party, there will inevitably be some people who are not as well acquainted with one another, if at all. To help them and other partygoers mingle, have a few icebreaker games on your party checklist. Almost any holiday offers an excuse to party. Consider the following suggestions for holiday party icebreaker activities that are sure to get guests mingling and sharing laughs in no time. Making New Year's resolutions is a tradition. Help guests get to know each other at a New Year's Eve party by playing a resolution game. When guests arrive, ask them all to write down their resolution on a slip of paper. It can be real or fake. After everyone has arrived, pass a bowl around with the resolutions. Each person should draw a slip out, then everyone must mingle in order to find out who wrote the resolution they picked. At the end of the game, have each person read his or her resolution out loud. Once your guests have all arrived at the party, ask them to sit at a table or in a circle. Pass around a bag of conversation hearts, with everyone grabbing a few out of the bag. Then guests must say one thing about themselves for every heart they have. Do not tell everyone at the Valentine's Day party the reason for taking the hearts. Otherwise, some shyer guests may not choose more than one or two. 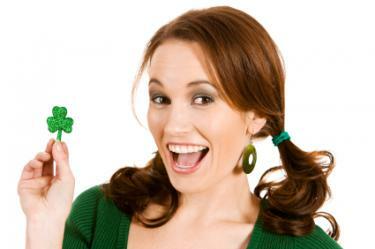 You can celebrate St. Patrick's Day with a fun game or two. These games are designed to get guests interacting and having a good time. Irish Hot Potato: Play Celtic or Irish jig music and sit guests around in a circle. Hand the first person the potato and when the music begins, they start passing it around. Once the music stops, the person holding the potato is out of the circle and the games resumes. Who am I? : Make up a list of popular Irish figures. They can be music stars, such as Bono from U2, or actors such as Colin Farrell or Pierce Brosnan. Write the names on sticky notes and tape one to each person's forehead without him or her seeing what is written on the note. The person must ask others questions to try and figure out whose name is on the note. Place eggs in a basket in the center of the room. Once everyone has arrived, have the guests introduce themselves, say what Easter means to them and choose an egg. After everyone has been introduced, open the eggs at the same time. The people who get the ones filled with bunny droppings must wear furry bunny ears for the rest of the evening. You can expand on this game by making a rule that if the people donning the ears hear someone say the word "bunny" during the Easter party, they can pass the ears on to that person. Create an imaginary line and have everyone stand on one side. Read from a list of famous United States historical monuments and places, such as the White House and Yellowstone National Park. Everyone who has visited the site should cross the line. If the next place is one they have not visited, they must cross back over. Start with places close to your home. This is a fun way to get conversations started about history, work travel or family vacations. Horror movies are a popular viewing choice for many people, especially around Halloween. Play an icebreaker that takes advantage of this. Ask everyone to share what kind of monster they would want to be in a horror movie and why. Guests with really creative imaginations can get this Halloween party game off to a spooky start. Play a faux Mad-Libs game for Thanksgiving. Write up a short comical story about how the turkey came to be on your table, leaving out certain words. Going around the room, ask everyone for a word, whether it is an adjective, person, place or feelings. Fill in the story with everyone's answers and read aloud the hilarious tale. The team that can dress and undress everyone in the fastest amount of time is the winner. To keep your holiday party interesting, keep games to about 20 minutes total. Try playing them with your immediate family or friends to judge how long they will take. Play an icebreaker after everyone has arrived, so no one misses out on any introductions or feels uncomfortable. 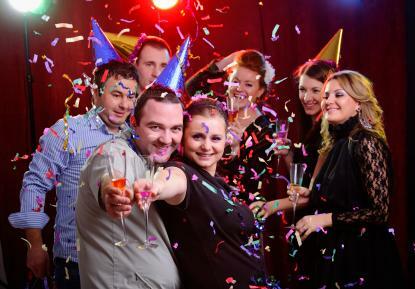 Be sure to cater your icebreakers to the crowd and type of party you are having. A large adult party might get rowdy, while small work parties might call for a more dignified game. Use your best judgment when picking your party games so that everyone attending has a good time.